Have a heart...a sweet bottle cap tin one that is, in our latest kit. It's just one of the fabulous items in our latest kit, Collecting Memories. You can also catch a glimpse of some of the others in the photo as well. I see letter stickers, gorgeous velvet flowers, sweet summery beads and even a tiny peek at a beautiful wood doily. 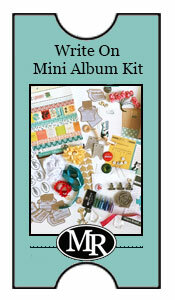 Collecting Memories is a mini album kit that's perfect for collecting your every day moments or those special events. We love mini albums as they make perfect gifts for the special people in your life and look great as a lovely display piece. So how could you use a bottlecap heart tin? We're sharing a second sneak peek as well today featuring a closeup of one of our designer samples. For this album, the tin heart makes a beautiful cover detail and is a great place to collage other accents. Getting excited about our new Collecting Memories release? We are too! It's just two more days away. Mark your calendars as it goes up for sale at 10 am CST Thursday May 29th. Stay tuned! More sneak peeks coming soon! Hey Roadies! We've been busy cooking up a new kit for you. Are you ready to check it out? We're excited to have a special new kit up for release in just a few days. It's a fun and unique kit and we think you'll love it. If you're been following our card kit releases, you'll know that we release them quarterly. Now and then throughout the year we also have some exciting additional kits to provide some creative fun. Our latest kit is called Collecting Memories and it's a fabulous mini album kit that is insanely full of our wonderful Maya Road product and many exclusives just for you. 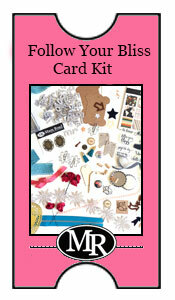 The darling flair you see in the above sneak peek photo is just one of the exclusives that can be found in this kit. We think it's too cute for words! Collecting Memories will be released on Thursday May 29th at 10 am CST. Check back in tomorrow for another peek at our latest kit!